Have you enjoyed John Green's Looking for Alaska, or Rainbow Rowell's Eleanor & Park? What about Speak, by Laurie Halse Anderson, Suzanne Collins' Hunger Games trilogy, or Stephen Chbosky's The Perks of Being a Wallflower? You can check out all of these titles at FCPL. But what constitutes "offensiveness"? Is there only one kind of intrinsic "appropriateness"--how do we know? Who should get to decide these things? Should you be prevented from experiencing specific books simply because somebody else disliked something about them? 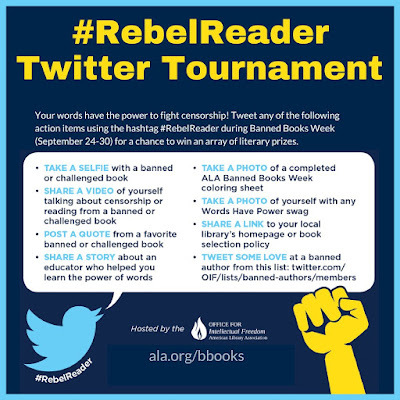 Libraries tend to think that you, the reader, should have the final say on that and, this week of all weeks, we invite you to exercise your freedom to read. Banned Books Week 2017 runs from September 24-30, and your local libraries are celebrating. At Clovis Library and some other branches, for instance, you can go on a Blind Date with a Banned Book (the covers are disguised and you choose your next adventure based on the book's listed "crimes" against public decency), and many locations are hosting Blackout Poetry and other thematic events. 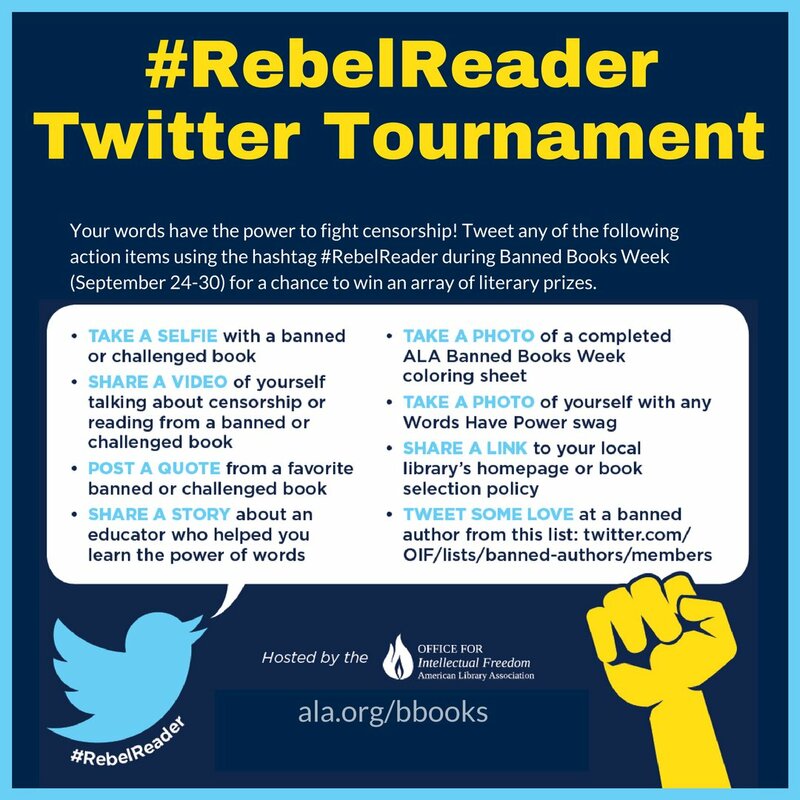 If you tweet, we encourage you to hop on your smartphone or other device and take part in ALA's Rebel Reader Tournament: you can post selfies with your favorite banned or challenged books, tweet some love at a banned author, or do another task listed in the graphic below for a chance to win literary prizes. Oh, yeah, and be sure to follow the Library on social media. Yes, we're on Twitter--Facebook, Instagram, and Goodreads, too!